BP/SP, LLC specializes in the diagnosis of osmotic blistering and resin hydrolysis damage, using both field test methods and standardized laboratory testing through highly qualified subcontractors. Lab tests are billed at cost to my clients. BP/SP, LLC is fully equipped with the on-site test equipment necessary for damage evaluations, such as: Ph meters, Ph sticks and tapes, microscopes, Barcol and Shore D durometers, and a variety of capacitance type electronic moisture meters. Although the lower part of this laminate appears resin starved, the normal translucent appearance of the laminates above the waterline indicate that this condition is not the result of a manufacturing defect, but rather occurred due to resin hydrolysis. Hydrolysis actually dissolves the resin out of the laminates. When the resulting liquids are constrained, fluid filled blister domes result, as visible at the circular features on the left of this photo. Removal of sample coupons for laboratory testing, and sequential grinding and moisture metering is a standard part of BP/SP, LLC field testing for osmotic or resin hydrolysis damage. Please note that I will not render a professional opinion on the condition of any laminate that's suspected of suffering from these conditions without conducting this type of destructive testing. I have a standardized form - 'PERMISSION TO DRILL AND GRIND' - which you can request by E mail - which details the nature and estimated expenses for these tests. I believe that this type of testing is appropriate because interpretation of electronic moisture meter readings is so difficult, and potentially inaccurate. Why? Imagine a soaking wet kitchen sponge for a moment, sitting on a Formica counter. Initially it is uniformly wet through it's thickness. However, after a few hours, the top surface is almost completely dry, while the sponge's bottom surface is still saturated. Now, imagine testing the sponge with a moisture meter. When it's totally soaking wet, the meter will accurately indicate that condition. Once the top is dry, however, and there is a gradient of moisture content through the sponge's thickness, the moisture meter reading will be an average of the sponge's moisture content, which will vary with the depth to which the meter can detect moisture. A shallow reading instrument might indicate that the whole sponge was dry, while there is actually lots of residual moisture lurking at it's lower surface. 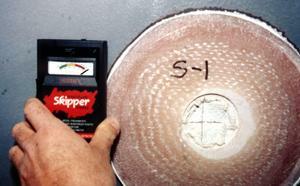 Note that this issue is less important when checking a blistered boat - it's obvious that it's got a problem. The 'depth detection' issue becomes far more critical in trying to determine when a laminate has dried enough to be barrier coated or repaired. Grinding into the hull 'ply-by-ply' while checking with a moisture meter as each new layer is exposed will quickly demonstrate whether a 'moisture gradient' is present through the laminate thickness. Laboratory testing of laminate moisture content 'ply-by-ply' will develop the same information with a higher degree of accuracy. 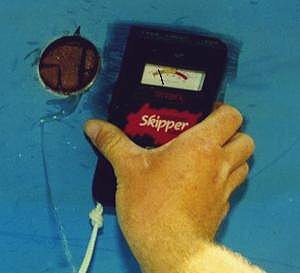 Grinding into the hull "ply by ply" while checking with a moisture meter as each new layer is exposed will quickly demonstrate whether a "moisture gradient" is present through the laminate thickness. 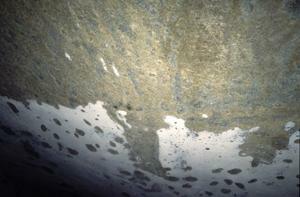 In these three photographs, a typical situation, where the surface is wettest, and the laminate stack becomes drier below the surface, is illustrated. Below the gelcoat and skincoat layers the moisture content of the laminate is approximately 50% less. 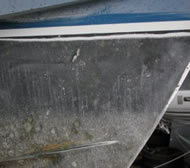 This type of test provides some preliminary information on how far a "wet" hull should be ground or peeled to remove compromised laminate and coating layers. 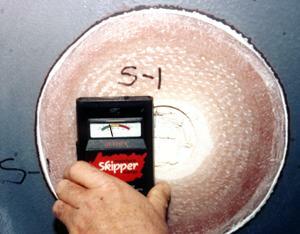 4 or 5 woven roving layers down into the laminate stack, the moisture meter readings are even lower. Laboratory testing of laminate moisture content "ply-by-ply" will develop the same information with a much higher degree of accuracy. Is This A Dry Hull? The outer laminates on this hull were approximately 1/8" thick. I checked the hull and, as you can see, the meter said it was "dry" or in the "green zone". 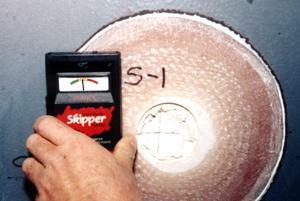 Next, I drilled this 2.5" hole, and gallons of water came pouring out, but the meter still said the hull was "dry". Moisture meters are essential diagnostic tools for marine surveyors, but do you see why I am cautious about how their readings are interpreted? Visit the Professional Boatbuilder website, www.proboat.com, to order a copy of bundled reprints of BP articles on osmosis - hydrolysis damage diagnosis, repairs, and moisture meters.